“A vivid, enchanting tale of friendship, trust, and adventure, good Tolkien-esque ingredients” (Kirkus Reviews): The final installment of The Wolf Chronicles, told from the point of view of Kaala—a young wolf facing the most perilous decision in her life. Fourteen thousand years ago in southern Europe, young wolf Kaala discovers that she alone can unite wolves and humans, and must do so for the survival of both species. In Promise of the Wolves and Secrets of the Wolves, Kaala came to understand her role. Born of a forbidden, mixed blood litter, and abandoned by her mother, Kaala struggled to earn her place in the Swift River pack. When she saved the life of a human girl, she put her hard-won acceptance at risk, and responsibility for keeping peace between wolf and humankind fell to her. She failed. Now, in Spirit of the Wolves, Kaala has one last chance. She leaves her home in the Wide Valley with her young packmates, the human girl she loves, and an obnoxious raven. Together, they travel to the land beyond the valley to find her long-lost mother and a solution to the problem of the humans, only to discover that new challenges await them. Only by calling on all of her strength and on the bonds of love with her human, raven, and wolf companions can Kaala hope to succeed. In this compelling conclusion to The Wolf Chronicles, Kaala must decide how far she is willing to go for peace…when every step she takes leads wolfkind and humankind toward war. 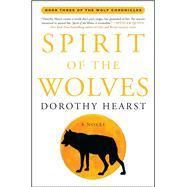 Atmospheric, exciting, and provocative, Spirit of the Wolves is “a crackling foray into a dangerous past…Dorothy Hearst’s keen interpretations of wolf behavior, senses, and sensibilities will enchant paranormal fans and animal lovers alike” (Publishers Weekly).